Activate your brand with us and our legion of followers! We didn’t get here on our own. Our greatest asset has always been the dedication of our exceptional people. In addition to an amazing community of automotive enthusiasts, friends and family, our sponsors have played a pivotal role in our success. Pulling off an event of this scale takes dedicated resources (passionate people and mucho moola), and we’ve been blessed with the unwavering support of unique and community-focused businesses. The Berwyn Route 66 Car Show Committee has developed a new and improved, high-impact sponsorship menu to put our sponsors in front of the 20,000+ people that visit our show as well as the additional tens of thousands of visitors that we host on our website and social media channels and in promotions with partners. Our goal is to preserve our Route 66 heritage and our local car culture in a community of mutual support with you. We are looking for stand-out businesses to join us in this mission. Your investment in the Car Show is an investment in the growth and vitality of our proud Route 66 legacy and in elevating your business’s exposure with auto enthusiasts. We are available to discuss sponsorship with you. Call us at 708-788-8100. The Berwyn Rt. 66 Car Show is located on the pavement of Historic Rt. 66. It is now called Ogden Avenue, between Oak Park Ave and Ridgeland Ave. View Map. 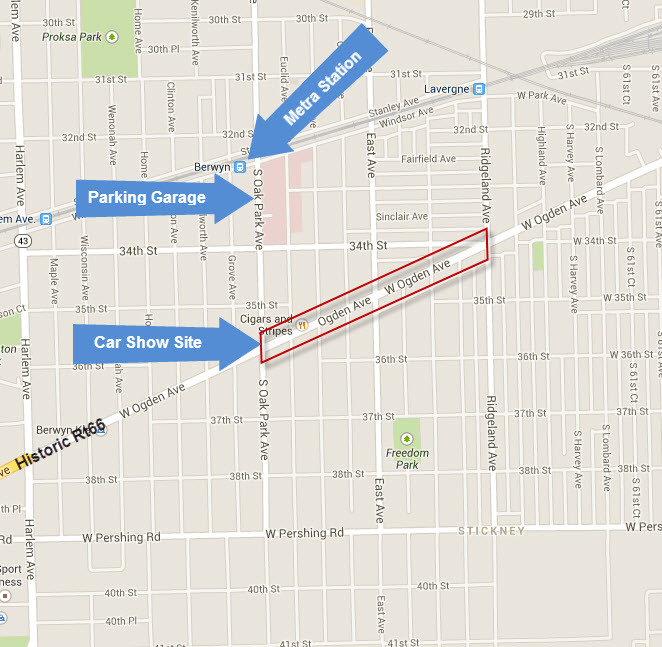 Parking is available on side streets and at the Berwyn Municipal Parking Garage, located at 3300 S. Grove Ave. The garage is a short 3 block walk to the show site. View Map. Convenient Public transportation is nearby. The Berwyn Metra train station is just 3 blocks from the show site. See Interactive Map & Schedules.